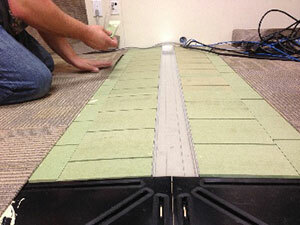 Core Cabling is an experienced and certified Connectrac™ installer. 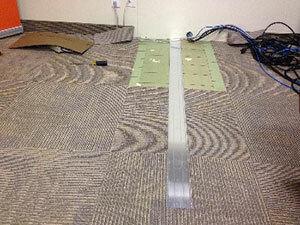 Office cabling solutions doesn't have to be an eyesore. CORE Cabling offers Connectrac™ installations for clean office network cabling! Connectrac™ allows for a clean installation of power and network data cables, allowing for efficiency and effective in space use. CORE Cabling has completed several projects for businesses that involve clean aesthetics, where Connectrac™ has been a perfect cabling solution. We are experienced installers of all Connectrac™ products. 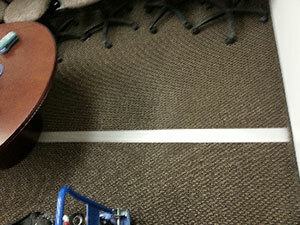 Connectrac’s versatility allows for cable runs to be located under carpets and desks, or for hardwood and concrete floors, the tracks can be laid on top of the surface within sleek-looking, unobtrusive tracks. In many cases, the Connectrac™ cable housing can actually compliment the aesthetic of the office environment. Connectrac™ is the perfect solution for office cabling, library, airport or any situation where cable runs need to feed multiple devices. It’s great for modern modular furniture, because it keeps cabling out of sight, while also keeping your work area safe.